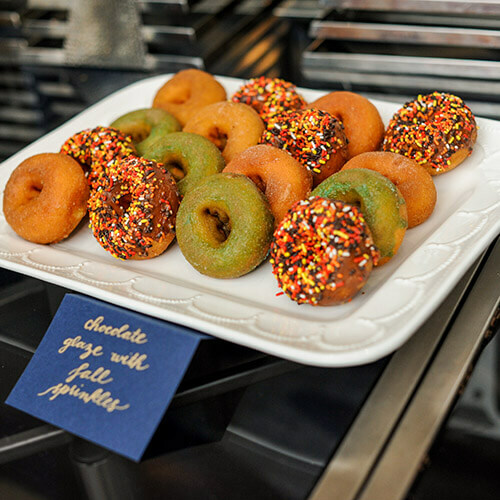 Donut Catering for All Occasions! Interested in sweetening up your wedding, event, or your office? We have you covered. Sandy Pony Donuts caters for all occasions. Why donuts? Because everyone loves them! They are a delicious and budget-savvy way to make a statement. You can also have a variety to meet everyone’s personal tastes. It’s a creative way to bring something everyone will love to your event. Nothing say’s ‘I Do’ like donuts. From donut walls, to beautiful displays, it not only looks great but tastes awesome as well. You can have a few or many different kinds of donuts, all sure to please. Check out our donut menu to see all the yummy and unique donuts we have. Some favorites? Try the Pony Party, Big Pearl, and the Charlie Brown! Have clients coming in or just want to offer your employees something nice? Donuts. We can do one time events, or you can set up your corporate account for weekly catering for your office. They are always a hit and easy to bring back to a desk or meeting room. All our donuts are made-to-order so you know they will be fresh and delicious. Ready to order? Fill out our catering information form. Let us know how we can bring our fresh, hot and delicious donuts to you. We proudly serve local City Dock Coffee and would be happy to add a box to your order. Need a cool drink? Consider our unique Bubble Tea. 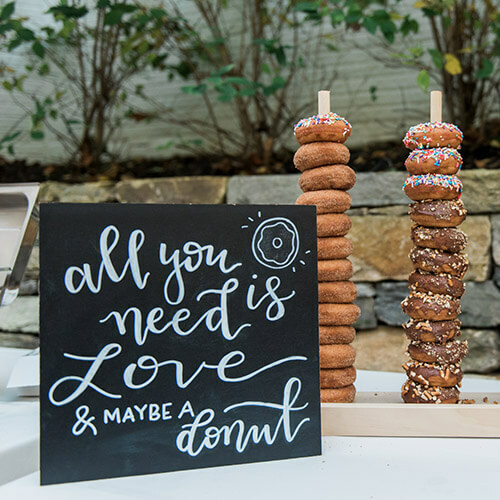 Custom Donut Cakes are available upon request and are the perfect addition to any party!